I want to show you how just a few simple hints and tips can help you solve (once and for all) some of your biggest oboe reed problems. The truth is, you can solve them yourself. And many reed makers do. We oboists are a determined bunch, and given enough time, we can accomplish most anything. But the reason I am writing to you today is because I want to help you solve your reed problems faster, with less effort and a whole lot less frustration. Then you can put your focus back on making music instead of just oboe reeds. The funny thing is, the solutions to some of the most frustrating oboe reed problems are just too simple and obvious to notice. I’ve lived this story many more times than I’d like to remember. I would walk into my lesson, frustrated and depressed that my reeds were sounding like pieces of tree bark. And with one simple tip from my teacher (usually something that I should have noticed myself) the problem just melted away. The fix was so simple, I couldn’t even see it. I was way too focused on the problem I was having. If you’ve been playing the oboe for a while, you know first hand just how many things can go wrong with your reeds. Sometimes they’re flat… or sharp… too open… too closed… not responsive… Sometimes they just flat out sound bad. The funny thing is, almost all of these problems can be traced back to the same five or six causes. That’s right. Most of the struggling reedmakers out there right now are suffering because of the very same 5 or 6 problems. A lot of oboe reeds cross my desk every month. From the oboe reed critiques that I offer to all of the reed shipments from our reedmakers. Plus the oboe reeds I make myself. It doesn’t make me special or anything, but it does give me perspective on what works, what doesn’t and some of the most common obstacles that can keep you from enjoying your oboe reeds. In an effort to improve my own reedmaking skills, I’ve also made a point to come in contact with a lot of different great reedmakers over the years. And I’ve encountered a lot of different reedmaking philosophies along the way. Some of my teachers make their reeds by following their “secret” 100 step recipe. They have a laundry list of dos and don’t that they meticulously follow day in and day out. It takes a lot of discipline and effort, but in the end, they having nothing but great reeds to show for it. Other teachers could make a reed out of a popsicle stick if push came to shove. Their recipe is nothing more than remembering a few simple, straightforward (and very powerful) reedmaking principles. But the one thing all of my teachers have in common is that, no matter what their “philosophy,” they all somehow end up making great reeds. The reeds are very different but they are all great. You could just sit down and play. Over the years, I’ve kept notes about all of these things in my “Reed Notebook.” It’s just a little spiral bound notebook – each page filled with my oboe reed notes from the last 15 years. By now it’s actually quite worn. The green cover is faded and some of the pages are falling out. But I find the information more helpful than ever before. You never know which “tip” will be most useful at any particular time. Some of the things I wrote down ten years ago didn’t even make sense to me at the time. Now they have become the foundation of my reedmaking ideas. Little did I know that one little fact about putting “roadblocks” into a reed would end up solving my “too much vibration” problem once and for all. I remember jotting that down during my lessons on the 4th floor of my teacher’s apartment in NYC – about 3 years before I needed it. This report is very short. Only 15 pages. In fact, that was my goal when I was putting it together. How much practical oboe reed advice could I cram into the smallest space? That was the question I kept asking myself. But don’t let its length fool you. It’s full of years of knowledge that can help you improve your oboe reeds, no matter what your skill level is today. Like my “Reed Notebook,” you never know which hint or tip will help you get past your most current reed problem. The six things that cause almost every frustrating oboe reed problem. The first and most important thing your oboe reed has to do, and how to fix it when it doesn’t cooperate. A quick tip for extending the life (temporarily) of a dying reed. When to consider using a narrower shaper tip. What to do when your reed is sharp AND flat! How to “fix” a reed that sounds great but is just too tiring to play. What to do when your reed just won’t respond. The report is only $17.00 and is available for download. You’ll get your electronic PDF copy within a few hours of submitting your order. Like anything in life, success is created by taking action. 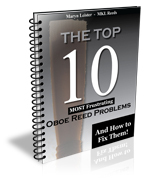 What better time is there to focus on fixing your oboe reed problems than right now? The sooner you get started, the sooner you will be able to get back to your “real” goal: making music. I am ready and willing to help you do it. P.S. Like I said, most every oboe reed problem you will ever encounter can be traced back to the same few principles – having a sharp, flat or unstable reed is really just a symptom of the real problem. Solve THAT and you will be well on your way to better oboe reeds. To order, all you have to do is call 1-866-220-9811 any time of the day or night, any day of the week. Or, you can order right here and now by clicking the link below.